Are You Ready to Get Out of First Date Hell and Into a Relationship With a Fantastic Man? Are you sick of going on dates that feel like a waste of time and aren’t leading you to the relationship you want? Are the men you’re attracted to not asking for a second date, while the needy or boring guys can’t wait to see you again? Are you not getting asked out at all and wonder why? Introducing a proven way to help you enjoy every date – no matter what! If the interesting, charming, attractive men are disappearing after one date or not asking you out, it’s NOT because something is wrong with you. There are just some things you don’t yet know. We will show you the REAL reasons why this is happening in your life – and how you can instantly turn your dating success around with some new information and easy-to-implement steps. You’ll learn how to be optimistic about dating and enjoy it, because you’ll be attracting the men you like and want. And you’ll do it without manipulation and without acting. In fact, you’ll do it by just by being YOU! You’re going to learn from two top dating and relationship experts who work exclusively with single women over 40. We believe that this is the BEST time to bring LOVE into your life. We know that you’re smart and you’re a busy woman. So during this course you will get the clear facts, without the fluff or the useless advice for 20-year-olds. 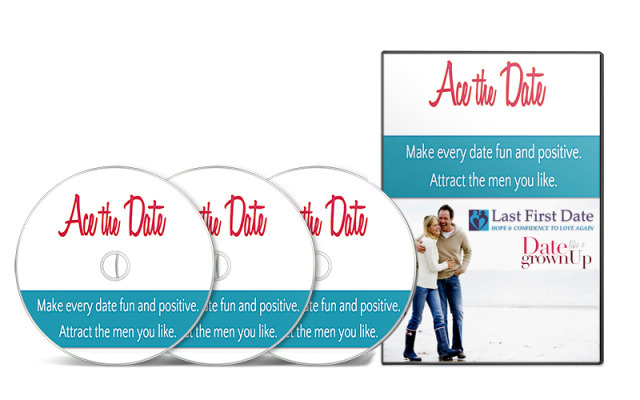 The ACE the DATE audio course gives you a new, deeper understanding of grownup men, along with proven TIPS and SCRIPTS so you can go on every date feeling like the smart, confident and in-control woman you are in the rest of your life…who also happens to be magnetizing the right men! Make every date fun and positive. Attract the men you like. YOU can make this happen when you have the valuable information from the ACE THE DATE audio course. Prepare for FIRST DATE SUCCESS by doing just 5 simple things. Finally UNDERSTAND the GROWNUP SMART, COMMITMENT-MINDED MEN you want to attract. GET TO KNOW MEN FAST and MAKE MEANINGFUL CONNECTIONS using our simple but super-powerful tip. Express who you are and what you care about so you can INSTANTLY MAGNETIZE THE RIGHT MEN and quickly identify red flags. MASTER PAINFUL FIRST DATE CONVERSATIONS using proven tips and scripts. GRACEFULLY HANDLE THE HARD QUESTIONS to avoid over-sharing or seeming rude or evasive. Use your BODY LANGUAGE and SIMPLE SCRIPTS to let Mr. Right know you’re interested so HE ASKS YOU OUT AGAIN AND AGAIN. Kindly and courageously walk away from Mr. Wrong WITHOUT FEELING GUILTY OR SECOND GUESSING YOURSELF. Create your NUGGETS and PREPARED STATEMENTS so you make your best first impression. LET GO OF YOUR PAST and prepare for a vibrant new future with the man of your dreams. Follow along and keep your notes to always refer to when you need encouragement or support. 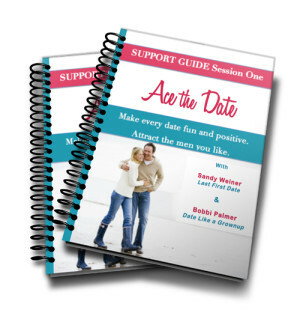 You will also get quotes and affirmations to keep you focused and optimistic as you go on dates in this new, exciting way. Dating online will greatly increase your chance of finding love. And if you don’t date online effectively, you’ll probably end up meeting all the wrong men or not meeting anyone at all. In this one-hour recording, dating coach Sandy Weiner shares tips that will help you find love online. It’s never too late to go on your last first date! All you’ll have to do is get to know him and decide if YOU want to pick him! (We are going to show you exactly how to get to know him without it feeling like an interrogation.) If you are over 40, and you want to bring love into your life (and have fun while you’re looking)…this is the perfect opportunity for you! We can’t wait to support you in your search for love! Order ACE THE DATE Today! Available for a limited time for only $149! Try Ace the Date for 7 days. It's packed with value, and I think you're going to love it. But if you're not 100% satisfied, just let us know why, and we'll send you a refund.